Customer service guaranteed. Our technician, Jamie Harrison, is on top of his game and ensures we are happy. We had an ant problem and scheduled an appointment. When Jamie came out, we couldn"t find where they were coming from. He gave us his cell phone and told us to call if we saw more. We called him and he fit us in the same day. I am appreciative for having Jamie as our technician and how he follows through to ensure his customers are satisfied and happy. I have been using Active Pest Control for many years and find them to be professional, consistent in their services and economical. Over the years, I have never had to complain about anything; therefore, I highly recommend them. Great customer! The technicians are very professional and knowledgeable!! I was very pleased with my initial service. Mr. Chumbly and Mr. Eckhart were great. Great service and thorough wrk. Best package for the price. My technician's response to my concerns about spiders, inside the house and outside, eased my worries. He gave tips on how to minimize intrusion. Very helpful. Thank you. Happy But can tell not all traps were checked as some still covered and buried in grass. Outstanding service, always professional and courteous. The services we have received has been outstanding. we are pleased with the way the company reaches out to us to stay in touch with happening and to keep us informed. Quarterly Outdoor home perimeter service effective. While service is good, one issue is still unresolved for months. Tech was very professional and knowledgable. He explained along each step as he treated inside and outside my home, and answered questions I had along the way. Great job! One of the best decisions I made in my 5 1/2 years of home ownership is signing on with your company. 100% satisfied. I was very pleased with my service did a excellent job. The office staff was great to. Would contact again for service. Very pleased with the professional and through service. Friendly and helpful representatives on the phone and at our home. We have been very pleased with all the services we have had done recently. We came to Active from Orkin after 30 years. 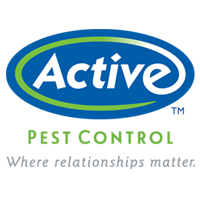 Active gave us exactly what we needed to protect us and our home from Termites, Mosquitoes and to keep insects out of our home. Darrell is our representative and knows the answers and is polite, professional and gets the job done. Very good company with an excellent staff employees focused on serving the customer. They are always professional and conduct buiness with a Southern Style pesonality. I have not one complaint in 10 years! Always call ahead do good job. Tim is great and personable. The customer service is excellent. I love that they call you before they come. They are prompt courteous and effective. We've had them for years and will continue. The serviceman was p0lite and pleasant. So far so good. I'm truly please with results. Tim Eckhardt has been such a professional, providing us with excellent follow up. He has been very responsive to our concerns and has been able to address our concerns rapidly and completely. We appreciate the excellent customer service he provides. Great rates and awesome customer service!! Thank you. The inspector was courteous & answered all questions. So far my service has been great. Friendly accommodating staff that are here serve me. The technicians have been terrific. Always good service no problems or issues ever. Friendly service professionals and quick service.